Why do we always have to tell the truth? We tell the truth only when it's a good thing. We lie to make the situation seem better when it's not. We tell the truth to guide someone who is lost in between the truth and lies. We also lie and trick the lost person into believing that the lie is the truth. We tell the truth when we know we have to be honest about things no matter how awful they turn out to be. We lie when we want to cover up the horrid truth and pretend nothing's wrong. We let the truth out when we want to resolve a problem. We lie to make things worse when they already as bad as it could get. We tell the truth when we need to get it off our chest. We lie when we want to keep the truth locked away from everybody else. We tell the truth when we don't want to get caught lying. We lie when we are too scared to be honest. When we tell the truth, we either cry tears of joy or sadness. When we tell a lie, a knife slowly stabs our heart and there is no cure. We tell the truth, but we also tell a few white lies. We lie, and we keep on lying until it becomes a habit. We tell the truth to hide our lies. We tell lies to hide the truth. We tend to tell the truth when we are calm and feel like it. We also tend to lie when being pressured by others who hope for the best when it's actually not. There is nobody in the world who is completely truthful but there are people who are full of lies. Being an honest person can be rewarding but it can also make one guilty. Being a liar can cover up the hidden truth and make everything seem right, but you feel the guilt and pain of lying. I won't lie about this because I lie too, at times. But that does not mean I cannot be honest. I am honest most of the time. But I can also be a liar as well as I am honest. So are you, my dear reader. There is no doubt that everybody lies but we have to know our limits. When it's time to stop, we stop. When you feel like lying, by all means; Go ahead -but you're all by yourself there. I don't know what I'm rambling about but I think I'm making a bit of sense. Maybe it's the fact that life is full of truths that seem like lies. Maybe it's the fact that so many lies out there that seem like the truth. Maybe it's the fact that I'm not satisfied with how much i THINK I've grown up, but I still can't seem to differentiate between the truth and lies. But what if other people can't differentiate that either? I feel so disoriented, jovial, dejected, melancholic, infuriated, content, disheartened, and placid -all at the same time. But essentially, I'm just confused. Once I know how to differentiate these two things, I know I have completely grown up. That is, if I'm completely sure I know how to deal with these things. Well, that's all for now. TOODLES! I have abandoned my blog for about 10 months now, and I don't promise that this post means that I will be more consistent when it comes to blogging -but honestly, I kind of miss blogging. As most of my friends should know, I am on a studying hiatus right now. I might or might not fly off next year due to personal reasons. I recently had a talk with my Uncle and Aunt one day and I actually feel like I can open up to them more now. I miss Izza. SO MUCH. I wish she was still living in Sunway, but then again, I'm happy that she decided to go back to Seremban. You know, in a "I'm-happy-that-she's-happy" kinda way. On another note, I'm glad that me and Harry are okay now. We've beem friends for so long, all we need it to push away all the drama. We don't need anymore drama. While I'm still on the subject of friendship, I am so happy that I have my girls again. Like, as in all four of us. I know I'm ranting about stuff I should probably be writing in my diary or journal, but nobody gives two fucks about my blog so I'll just say everything here. JEEZ okay I'll stop here before I write a novel. Rest in Peace, My Darling Tigre. Today, I had to put my favourite cat to sleep. The vet said there was no more hope for him. Kidney failure and severe viral infection. I watched as the vet injected an overdose of anesthesia to ease him from his pain. 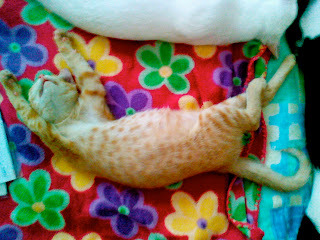 I first found Tigre when he was about 2 months old in December 2009. He was walking in the middle of the road. I asked the driver to stop and I picked him up and brought him home. He had an injured paw. But it healed after getting a shot from the vet. He was very affectionate and loved people. He would just sit there and let you cuddle him. Sure, he loved leaving presents at the neighbour's doorstep, but we loved him anyway. He would only let out his soft meow when he wanted us to open the door, and the usual hunger meow. A lazy bum, a sleepy head. He was very playful as a kitten. Even as he grew older, he loved playing around. But this morning, it was different. He fell down from the top floor of our 4 storey cat cage. And he just lay there. Liquids started coming out of his mouth. But he never licked them away. He just lay there and shivered. I carried him, I wiped away the liquids from his mouth. His pupils were fully dilated even in the bright light. I immediately remembered how he was as a kitten. I put him in the carrier and brought him to the vet. He was breathing heavily and just staring upwards. I couldn't stand to watch him suffer anymore. When the vet put him to sleep, I just stood there. Looking at my precious little baby. He took one last breath, and he was gone. You were always my favourite cat. "Human beings are the only creatures on earth that allow their children to come back home. "-Bill Cosby. "One good thing about music, when it hits you, you feel no pain. "-Bob Marley. TRIBUTE TO ROCK KANGKANG 2010!